The stock market is so corrupt, such a gamed enterprise it is comical and is no place for 401k type investors to have their life savings and only retirement funds at risk with the lunatics and absolute corruption of the US stock market. I am an experienced market participant so I know all the tricks from the inside, and even I am fooled by Wall Street shenanigans from time to time, and I have seen it all and have historical data and sophisticated tools that the mom and pop investor has absolutely no ability to access. Take my advice and put your incredible gains - you have probably through dumb luck actually performed better than most hedge funds - but take these massive gains and park your capital in a nice and safe money market fund or cash equivalent instrument depending upon your company`s plan options. The recent trend has been to sell off the market before the job`s report, this is ultra-conservative smart money wanting to get out before the jobs number as the market sold off for five days, and as soon as the number comes out and there are no extreme deviations with market implications, to jump right back into the market, the exact same pattern happened last month the week before the release of the jobs number, the same thing happened this past week in markets. The takeaway -- Markets are somewhat Predictable – think of valuation levels in terms of Predictable Market Timing Strategy. Accordingly take this opportunity of the rally to exit current market holdings and change your monthly 401k contributions which are going into bond and equity funds to now go into cash equivalents. 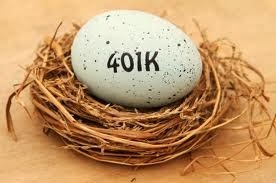 This means all of your Retirement Accounts from IRAs to 401ks are effectively in Cash! These instruments aren`t going to pay you anything literally, and yes you are going to be losing value due to the effects of inflation, but you cannot look at investing in that manner given the current market valuations, your first priority since these are for most of you - your only retirement savings – that Return Of Capital is your real true concern at this point. Furthermore, given these valuations in financial assets and the bubbly market forces that have enabled considerably favorable scenarios to take place: From low-interest rates, 85 Billion of Monthly QE Injections, Bond Purchases by the Federal Reserve, Large Stock Buybacks, Lack of Investment Options in Emerging Markets; the associated risks are too great to take a chance on given these are your retirement funds. Put simply the risk versus the reward in financial markets is too great for these funds. Yes the stock market via many models will continue to rise into the new year if recent patterns continue as fund managers like to push up markets the first four months of the new year to make their numbers, and with even a slight taper there is still going to be at least 60 Billion of Fed Liquidity injected into stock and bond assets each month, so there is more impetus for markets to go higher versus any natural selling pressure. However, this is not your primary concern because you don`t know when to get out, and the insiders do, and the big players will decide when the party is over, and let me remind you that professional, large players can hedge entire portfolios for as cheap as 5%, something that mom and pop investors just will not be able to accomplish given their limited resources. Do These Valuation Levels Compare Favorably to Entry & Exit Points over last 15 Years? Your primary concern as a 401k Investor should be: Are these valuation levels where I feel comfortable for the long haul holding given the history of the stock and bond markets over the last 15 years? Moreover, in looking back I would guess that most of your 401k has been halved or worse several times over the last 15 years, and some of you have been completely wiped out with many companies going out of business or on the verge of going out of business like Blackberry or JCPenny. Let me reiterate these are not valuations built on outstanding earnings, these are valuations built pure and simple on “multiple expansion” which is a euphemism for QE Injections into stock markets via Asset Purchases; these are valuation levels that will not hold up over time. So sure the stock market can go up another 11% early next year before the full taper, and eventual stock re-pricing occurs, but the rewards of another 11% upside to your portfolio – I mean life savings – isn`t worth the potential of a 25% or more haircut – meaning no return of your capital – if and when the big boys decide to front run the exodus, which they can do at any time, and you will be the last to realize that no one is coming to buy this latest dip in markets. Wall Street skewers even some of the most sophisticated investors at the drop of a hat, i.e., look at how the big banks and hedge funds made John Paulson liquidate some of his gold holdings in late June of this year during a shorting attack on Gold, and as soon as they covered these short positions Gold went right back up to where it was before the short shark attack at the 1400 level. Gold is retesting these Paulsen Liquidation levels once again in another concerted Gold Shorting attack and even the experts don`t have any real notion of how low Gold can fall if certain technical support levels fail. This is just an example to show how one never gets wedded to positions, lines have to be drawn, risk parameters have to be established, and cost benefit analysis has to be modeled even for 401k investors, and the future risks just don`t justify having your retirement savings in equities or bonds at these levels of valuations. Sophisticated investors can have a better feel for when to get out based upon their vast inside knowledge, market experience and key technical levels but a mom and pop investor who occasionally checks their portfolio once a month at best has no chance of perfectly timing the inevitable market exodus. The really big players will know when to get out because they are the ones moving the market with their selling, no need to market time when you are big enough to actually move the market, these guys never lose, trust me when they decide to sell, they have puts and derivatives in place to capture immense profit on their exodus of positions. Therefore, not only does the 401k investor get hit by the big guys exiting large positions in the market, but these guys are shorting the market at the same time, causing selloffs to the market and the 401k investor`s retirement portfolio to be exacerbated and magnified on the way down. Yes these guys don`t play fair 401k investor – this is not a safe place or good spot to have your life savings at risk with these sharks playing in your fresh water pond. Salt be damned, your portfolio will see more red in your quarterly statement than you could possibly imagine in such a short amount of time – financial markets often take the escalator up, and the freight elevator down! So sure the market could potentially go up another 11% the first half of the year but just juxtapose this upside scenario versus all the time your 401k has become a 201k over the last 15 years, your AIG and Citi stake has been completely wiped out, and these were legitimate fortune 500 companies not some risky penny stocks. Markets are corrupt, markets are corrupt, markets are corrupt – this is the first lesson to take to heart as a market participant Mr. and Mrs. 401k Investor – Caveat emptor – protect yourself at all times!